CPQ or Configure Price Quote Software can be a useful application that sits within the context of the Internet of Things (IoT) and the digital transformation. The IoT has promised many benefits to business in the coming years, and some of these benefits are already being delivered. One not so wonderful aspect of IoT is the sheer volume of data that is being created. A 2015 article in Forbes Magazine tells us that more data was created over the previous 24 months than previously existed over the entire history of the human race. The obvious challenge for business and actually, any consumer of information, is to be able to sort through all of the data available and extract and format the useful data into something beneficial. Our needs should drive the specific data required to execute our tasks. CPQ is an application that both consumes data and generates data. In that sense, CPQ behaves like an information-powered device. Data inputs are gathered and stored and then matched with specific requirements that are gathered as additional data. Then, from that mix of data, specific outputs are created in the form of quotations, proposals and solicitations to engage in a sales transaction. CPQ tells us exactly what it needs to do its job. Adding unnecessary data to CPQ accomplishes nothing. So, to that degree, our burden of useless data can be reduced by simply ignoring that which is not relevant. 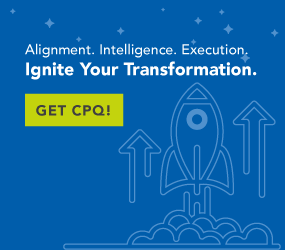 CPQ requires specific data inputs related to product, usage and other factors that go into configuring a solution targeted to match a specific need. Product identification data is used by CPQ as the basic building block for turning out a specific product configuration. Product identification data includes specific part numbers, part descriptions, specifications and the hierarchical combinations of parts that comprise assemblies and sub-assemblies. Product Management or Product Administration operations within the organization provides most or all of this data. Configuring a product requires more that throwing together some parts. For each part, assembly and sub-assembly, there are specific usage requirements, limits and compatibility factors that must be used to clear that part of inclusion in a specific configuration. These usage limiters may involve things like ambient temperature, salinity or corrosiveness of the environment or materials contacting the part. That data (that knowledge) is what makes CPQ so desirable. This information is provided by Product Management and Engineering. It is highly technical in nature, and the ability to “digitize” this expert information is the key to transforming the sales transaction into a digital transaction. Other values, such as part availability, lead times and inventory levels are provided by the resident ERP and Supply Chain Management systems. These can inform specific choices made in terms of sourcing or configuration alternatives selected for the actual solution delivered. For each of those parts and assemblies, cost and pricing data are provided to allow CPQ to roll up a finished, fully configured price for any class of customer located anywhere in the word at any time. Marketing and Finance supply CPQ with all of the pricing variables needed to price out a configuration. Volume discounts, localised currency pricing and special contract pricing variables are all built into CPQ. Both the sales rep and the customer know they are getting the right price for the product under construction. CPQ manipulates, stores and modifies the data received as it executes its configuration and quotation functions. This data has value beyond the specific transaction initiating the configuration process. CPQ provides data to transactional systems downstream and also to storage for analytical systems used within the enterprise. As the configuration process is completed, specifics about the configured product are communicated into the order management system, supply chain and inventory systems. A full bill of materials with associated line item pricing is also generated. These outputs are manifested as quotations, proposals or sales orders, depending on the stage of the sale in process. In addition to the specific product and pricing information, details related to the buyer are also collected and transmitted downstream. For quotes, the date of the action or timestamping is executed to document exactly what is being quoted at that specific time. If a proposal is desired, CPQ can generate a complete proposal automatically listing everything related to the product proposed, including parts, prices and any special requirements. Proposals, quotation and pricing information can be immediately transmitted electronically to the customer or produced in hardcopy if required. Electronic or hard copies can also be generated for the sales rep and documented within CPQ. When an order is placed, all of that relevant product, pricing and customer data is transmitted to the order management and billing system, along with the production planning and scheduling systems. The entire transaction is a paper-free, digital process. Collectively, all of this data created by CPQ can be stored for later analytical purposes. We’ll explore that in our next blog, CPQ and Business Intelligence.